On October 22nd Japanese fans get one of their most significant domestic shows of the year, The Strongest Korakuen. The show decides a number of Japanese mandatory challengers for the following year and features several intriguing bouts, even if the card is a rather small one with only 5 bouts listed at the moment. 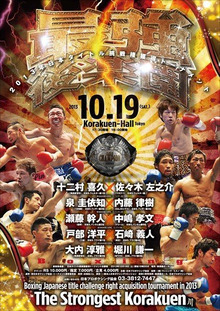 The poster features the 10 fighters and the Japanese title, that they are all essentially trying to earn a shot at for next year. It's a simple but effective poster that says everything you need to know about the show. The annual "Strong Korakuen" tournament, the tournament to decide the next Japanese title challengers, hits "the hall" this week and this is the poster for it. Unfortunately for such a big event the poster is pretty weak in all honesty though it does contain the fighters and the fights. Sadly however the sport of boxing isn't the most predictable and whilst there are 5 fights listed, and 10 fighters on the poster, 1 of the bouts is actually off. Whilst the contest between Yoshihisa Tonimura and Sanosuke Sasaki is off, we still get 4 genuinely excellent bouts!